Posted on Wednesday, March 20th, 2019 in Wedding Bands. Since the summer months are the most popular time to get married, we’re approaching that time in the year when many couples are looking to purchase their wedding bands before their big day approaches. Based on what we’ve noticed so far this year, here are the top three wedding band trends for 2019. Larger Diamonds: This year, it appears bigger is better. Many brides-to-be are selecting wedding bands that have a smaller amount of diamonds, but are much larger in size. After all, who doesn’t want a wedding band that really sparkles? We found that wedding bands that feature larger diamonds tend to complement solitaire rings the best. Smaller diamond bands can appear even more minuscule than they actually are when placed next to a solitaire ring with a large diamond in the center. Because of this, many future brides are selecting larger diamond bands to supplement their one-diamond engagement rings. And since solitaire rings continues to be the number one choice for engagement rings, it’s no surprise that larger diamond bands have been very popular as well. Precious Metals: Lately, we’ve been seeing an increase in the number of couples selecting precious metals for their wedding bands. Platinum and gold (white, yellow, or rose) have been the most popular wedding band metal choices so far this year. Typically, we see most soon-to-be brides selecting the same metal as their engagement ring, so it makes sense that these women choose platinum or gold for their wedding bands since these are the two most popular options for engagement rings. For men, we usually see more diversity when it comes to the metal type for their wedding bands. In the past, we’ve had many future grooms choose a more contemporary metal for their wedding bands. Stainless steel has been one of the most popular choices in recent years. However, this year we’ve been noticing more interest in the more traditional precious metals for men’s wedding bands. Whether it’s because they are starting to realize the importance of these rings as a symbol of one’s love and commitment to his/her spouse or are just wanting their own piece of valuable jewelry, many men are ditching the cheaper alternatives for something a little more substantial. Two Instead of One: You may be asking yourself, why would anyone need two wedding bands? Well for the brides-to-be, two wedding bands create a sense of symmetry that many women seek. With just one wedding band placed next to the engagement ring, the other side of the engagement ring can appear a little desolate. However, when a wedding band is placed on both sides of the engagement ring, the set looks a little more complete. For the groom, two wedding bands allow him to wear the bands during different occasions. Unlike the bride, he won’t wear the bands at the same time. Instead he’ll wear wear his valuable wedding band (typically a gold or platinum one) most of the time and he’ll wear his less valuable band (typically a stainless steel one) when playing sports, exercising, or doing work around the house. If you’re in the market to purchase wedding bands, contact Kloiber Jewelers at 414-276-2457 or info@kloiberjewelers.com. We’ll guide you through all of your different options and help you select the perfect wedding bands. 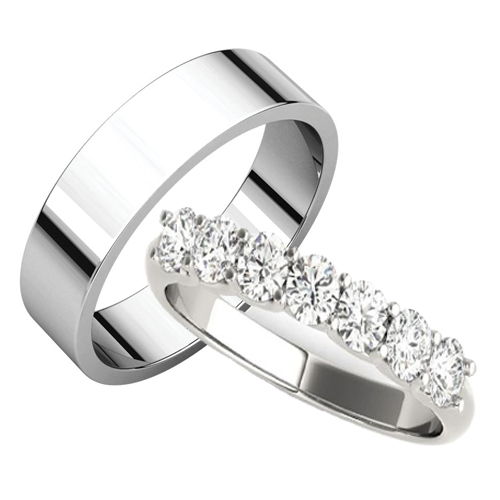 To view our current diamond wedding band collection, click here. If you don’t see exactly what you’re looking for, don’t worry. We can create the exact ring you always envisioned.